People are often confused when they talk about whole wheat and whole grain. It may be difficult to distinguish between whole grain and whole wheat, because they look very similar. Though one can come across many similarities between whole grain and whole wheat, one can also find many differences between the two. Whole grain contains the entire grain kernel, which includes the bran, endosperm and germ. However, whole wheat is a refined grain that has lost the bran and germ, and only contains the endosperm. Whole wheat is obtained by a refining process, where some of the nutrients are lost. On the other hand, whole grain does not go through the refining process, which means that the nutrients are intact. One of the main differences, is that whole grain has a richer flavor than whole wheat. Another difference that can be seen, is that whole wheat is lighter in texture, and whole grain is denser in texture. Well, whole grain has more nutrients, minerals and fibers than whole wheat. Both whole grain and whole wheat have many health benefits. Whole grain is considered to be good for diabetic persons as the grain is a good source of carbohydrates. Unlike whole wheat, whole grain is absorbed more easily by the body’s system. Well, another difference that can be seen, is that whole wheat has a longer shelf life than whole grain. When comparing the fat content in whole grain to that in whole wheat, the former has a lower fat content. When considering their price, whole grains are slightly higher priced than whole wheat. Moreover, whole grains contain more oil than whole wheat. 1. Whole grain is not refined, whereas whole wheat is refined grain. 2. Whole grain contains the entire grain kernel, which includes the bran, endosperm and the germ. On the other hand, whole wheat contains only the endosperm. 3. Whole grain has more nutrients, minerals and fiber than whole wheat. 4. Whole grain has a richer flavor than whole wheat. 5. Whole wheat is lighter in texture, while whole grain is denser in texture. 6. Unlike whole wheat, whole grain is absorbed more easily by the body’s system. 7. Whole grains contain more oil than whole wheat. Prabhat S. "Difference Between Whole Wheat and Whole Grain." DifferenceBetween.net. 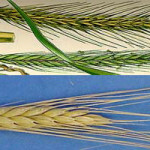 March 3, 2010 < http://www.differencebetween.net/object/comparisons-of-food-items/difference-between-whole-wheat-and-whole-grain/ >. Both the terms whole grain & whole wheat are quite similar and many people are confused among these two terms,but this article is good one to completely distinguish the terms.Whole grain is not the refined one whereas whole wheat is the refined one.Thanks to you for sharing the benefits of whole grain along with whole wheat. Glad to come across this article after doing a google search. I only found out there is a difference today when I went into my Deli and asked for a Whole Grain club roll and the guy behind the counter told me he has whole wheat, not whole grain. I asked him what’s the difference and he told me briefly but I did not fully understand. This article makes it much clearer. In appearance, I still can’t tell the difference. The whole grain rolls are best to consume the same day purchased as they do not keep fresh for long. Now I know why some rolls were not that fresh the next day whereas others (Whole Wheat) kept fresh a day or two after I purchased them. I don’t think this is accurate. Whole wheat is refined FROM the whole grain, including the bran and germ. If it only contained endosperm, it would be white, not whole wheat. this article was very interesting, the reason i look this up because the cookie ingredients called for wheat bran, the store didn’t carry it so I bought oat bran and wheat germ I still don’t know what to use. I’m, thinking of using oat bran to see what happens. I believe I should use oat bran because its soluble, maybe the cookies will not run. thanks for this information, big help. Quaker makes a box called “Unprocessed Bran” and it is wheat bran (check the ingredients: wheat bran). You can usually find it in the oatmeal section of any grocery store. Oat bran is a totally different taste and your cookies will probably taste like oatmeal cookies if you substitute oat bran. Oat bran is also different from wheat bran in its type of fiber. Wheat bran is mostly insoluble fiber whereas oat bran I think is half soluble and half insoluble. Wheat is a type of grain. Whole grain may include many kinds of grains, including barley, rye, wheat, rice, millet, corn, oats. Whole wheat is simply whole wheat. Whole wheat is not refined if it says “whole”. The manufacturers play games with names and labels offering endless variations. The best way to tell what you are getting is the item should say WHOLE GRAIN if it is unrefined ingredients. If it says WHOLE Wheat, or WHOLE Bran, or WHOLE Fiber or OAT Bran, or WHOLE Oats or anything other than “WHOLE GRAIN” it is not the same, unrefined product. As far as fiber content, that you have to read the label to tell the quantity of fiber. Fiber can be added to the product in a very high content, that still does not make it a WHOLE GRAIN product.